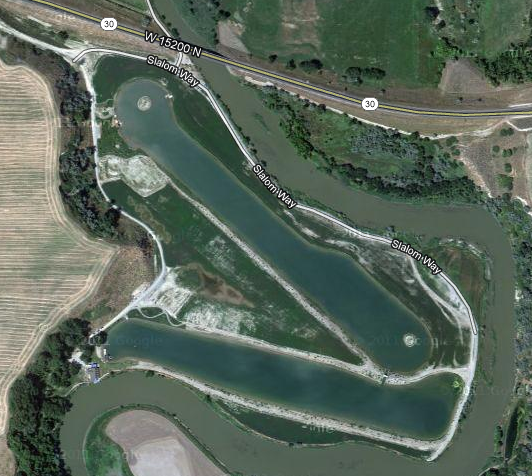 Utah Open Water: Ski Lakes as Swimming Venues? I happened to come across this article on KSL.com this morning about a new development called Still Water Lakes that is planned in Syracuse. The development includes two man-made "ski lakes" surrounded by home lots with private docks. A year or so ago, I heard about a similar development planned in Eagle Mountain. I also learned that there are two other similar "ski lakes" already in operation: Last Chance Lakes near Tooele and Bear Hollow Lakes in Garland. As you may have guessed, reading about these developments got me thinking about swimming in them. The lakes are designed for water skiing and wake boarding and are probably pretty busy with boats during the warmer months. But I wonder if they could be used for swimming events in the "off hours". I couldn't find a description of how long any of the lakes are, but Bear Hollow Lakes looks to be about 700 yards between the turn islands. The shorelines of the lakes are designed to minimize "rough" water and keep the lakes as smooth as glass. This would be ideal for beginners and for racing. Some of the developments even include clubhouses with showers, lockers and other amenities. Spectators would have great views of the whole race. It's probably just wishful thinking, but how cool would that be? !